EMC integrates with VMware more than any other vendor. 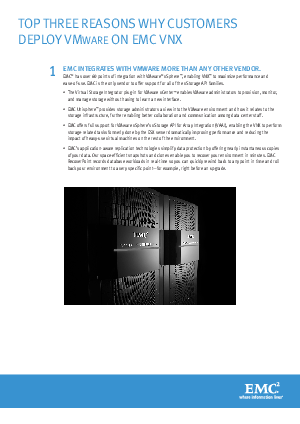 EMC® has over 60 points of integration with VMware® vSphere™, enabling VNX™ to maximize performance and ease-of-use. EMC is the only vendor to offer support for all of the Vstorage API families. EMC VNX is built with virtual environments in mind. Above and beyond direct integration with VMware, VNX has many features that complement a virtualized environment. EMC does the most to enable customers to properly implement and maximize the benefits for VMware Virtualization. Through EMC Proven™ Solutions, EMC helps customers enhance the performance of VMware vSphere and other VMware applications while minimizing risk. EMC rigorously tests vSphere deployments too - from the serve, to the network, to the storage array - to ensure performance and scalability requirements are met.